Disposing of confidential waste in the UK is governed by laws such as the Data Protection Act 1998 and in the EU the GDPR (General Data Protection Regulation) will be implemented in May 2018, which will also have an impact on British rules and regulations. 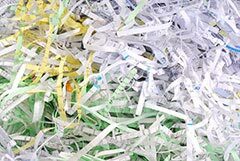 Confidential waste includes a wide range of documents that companies will have and need to dispose of appropriately. If a document contains any sensitive information about other parties (whether they are employees, customers or suppliers) then it will be classified as confidential waste when it is no longer required and needs to be disposed of as such. If a third party got hold of this type of sensitive information with malicious intent, they could cause serious harm to the individuals or businesses involved. Some of the ways that this information could be used maliciously could include identity theft, fraud and blackmail. For this reason how confidential waste is disposed of is important and is strictly regulated. Companies should be aware of all information security risks regarding documentation containing sensitive information, have a process for securing and destroying this information as required, and train up any employees who are dealing with this information to adhere to this process and related best practices. If the amount of confidential waste is too big to manage internally, the Data Protection Act requires companies to use a specialist confidential waste disposal service to get rid of sensitive documents. These services will be provided by a company who is able to securely collect the documents, make sure that it isn’t accessed on the way to the waste processing facility, destroy it appropriately and provide a certificate to the company hiring them in order that they can prove that they have complied with the law in this regard. The standards governing this process include for example checking staff who are responsible for confidential waste disposal, so it’s important to check that company providing the confidential waste disposal service is complying with these standards. If you are going to use a confidential waste disposal service then look for a provider who has both on and off site information destruction services. Check how they secure confidential documentation during transit as well as how they destroy the data once it arrives at their waste processing facility, as well as whether you are able to watch the destruction process if you necessary. Most importantly, you need to ensure that they will provide you with the relevant Certificate of Destruction so that you can prove that you have complied with the law if required. Whether you are a company who needs bags to store and dispose of your own confidential waste, or whether you are a company who provides a confidential waste disposal service to others, Abbey Polythene can provide a range of confidential waste bags for the disposal of shredded waste and sensitive materials. These bags are clearly labelled to make it easy to identify and segregate confidential waste. Find out more about our confidential waste bags.